In vitro biochemical and/or cytological analysis showed that cazanidatin inhibits MET, VEGFR-1, -2 and -3, AXL, RET, ROS1, TYRO3, MER, KIT, TRKB, FLT-3, and TIE -2 tyrosine kinase activity. These receptor tyrosine kinases are involved in both normal cytological and pathological processes such as tumorigenesis, metastasis, tumor angiogenesis, drug resistance, and maintenance of the tumor comfort environment. 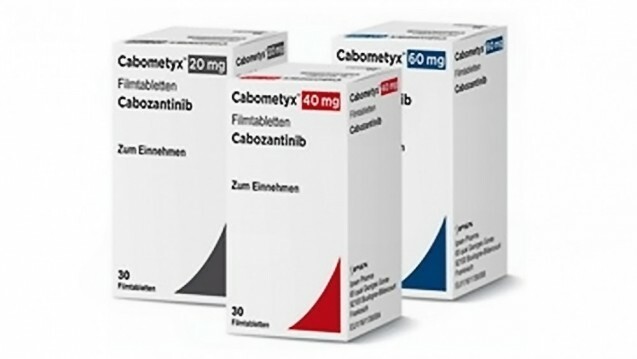 CABOMETYX is a kinase inhibitor suitable for the treatment of patients with advanced renal cell carcinoma (RCC) who have received previous anti-angiogenic therapy. (1) Recommended dose: 60mg orally, once a day. (2) Instruct patients to take at least 2 hours before and after taking CABOMETYX for at least 1 hour. (3) Do not replace CABOMETYX tablets with cazantinib capsules. 20 mg, 40 mg, and 60 mg tablets. (1) Bleeding: Do not give CABOMETYX a history of severe bleeding. (2) GI perforation and fistula: monitor symptoms. The fistula that is not properly treated or perforated is terminated. (3) Thrombotic events: CABOMETYX is terminated for myocardial infarction, cerebral infarction, or other severe arterial thromboembolic events. (4) Hypertension and hypertensive crisis: Regularly monitor blood pressure. CABOMETYX can be terminated by not being able to control hypertensive crisis or severe hypertension with antihypertensive therapy. (5) Diarrhea: May be severe. Immediately discontinue CABOMETYX treatment until diarrhea is resolved or reduced to level 1. Recommended standard anti-treatment. (6) Palmoplantar Red Syndrome Syndrome (PPES): discontinue CABOMETYX treatment until PPES resolves or reduces to grade 1. (7) Reversible posterior leukoencephalopathy syndrome (RPLS): termination of CABOMETYX. (8) Embryo-fetal toxicity: can cause fetal harm. Advise women with reproductive potential on potential risks to the fetus and use effective contraception. The most frequently reported (≥ 25%) adverse reactions were: diarrhea, fatigue, nausea, loss of appetite, palmoplantar redness syndrome (PPES), hypertension, vomiting, weight loss, and constipation. Strong CYP3A4 inhibitor: Reduce the CABOMETYX dose. (1) Mild to moderate liver damage: Reduce the CABOMETYX dose. (2) Breastfeeding: Do not breastfeed when taking CABOMETYX. February 29, 2016, Exelixis and Ipsen jointly announced an exclusive licensing agreement for the commercialization and further development of cabozantinib indications outside of the United States, Canada and Japan.